There are 54 Assisted Living Facilities in the Bronx area, with 12 in Bronx and 42 nearby. The average cost of assisted living in Bronx is $1,225 per month. This is lower than the national median of $3,346. To help you with your search, browse the 331 reviews below for assisted living facilities in Bronx. On average, consumers rate assisted living in Bronx 3.0 out of 5 stars. Better rated regions include Clarence with an average rating of 4.4 out of 5 stars. Caring.com has helped thousands of families find high-quality senior care. To speak with one of our Family Advisors about assisted living options and costs in Bronx, call (855) 863-8283. The Bronx, New York is one of the five boroughs of New York City. The Bronx is considered the city's greenest borough, so seniors who are attracted to living in New York City but want more access to the great outdoors should consider the Bronx. The Bronx is home to Pelham Bay Park, a park three times the size of Central Park that offers miles of hiking trails, two golf courses and a variety of plant and animal life. In the Bronx, assisted living facilities are called adult care facilities (ACF) and are known as establishments that provide long-term residential services to adults. ACFs in the Bronx are licensed by the New York State Department of Health and are categorized as either adult homes, enriched housing programs or residencies for adults. There are 54 ACFs in the Bronx area, with 12 located within the borough limits and 42 others located nearby. Seniors choosing to live in the Bronx have access to multiple arts and cultural events and venues such as the Bronx Museum of the Arts provide senior discounts for membership prices. For sports lovers, the Yankees Stadium is located within the borough's limits. The climate in the Bronx is similar to the rest of New York State, with humid summers and frigid winters. Seniors who dislike cold, windy weather should be aware that the Bronx's location means that nearly half the year is windy. The Bronx has an array of community resources for seniors, including the Melrose Mott Haven Senior Center, an organization that provides health screenings and group meals, as well as more than 10 other senior centers. The Bronx area is home to world-class medical facilities, including North Central Bronx Hospital and Bronx Lebanon Hospital Center, in the event of medical emergencies or illness. The cost of living in the Bronx is higher than the average across New York State and the national mean. Seniors can expect to spend most of their budget on utilities and housing costs in the area. The Bronx has the second-highest crime rate in New York City, but the second-lowest number of surveillance cameras. Seniors who often travel unaccompanied should be aware of the high crime rates in the Bronx. Assisted Living costs in Bronx start around $1,225 per month on average, while the nationwide average cost of assisted living is $4,000 per month, according to the latest figures from Genworth’s Cost of Care Survey. It’s important to note that assisted living rates in Bronx and the surrounding suburbs can vary widely based on factors such as location, the level of care needed, apartment size and the types of amenities offered at each community. 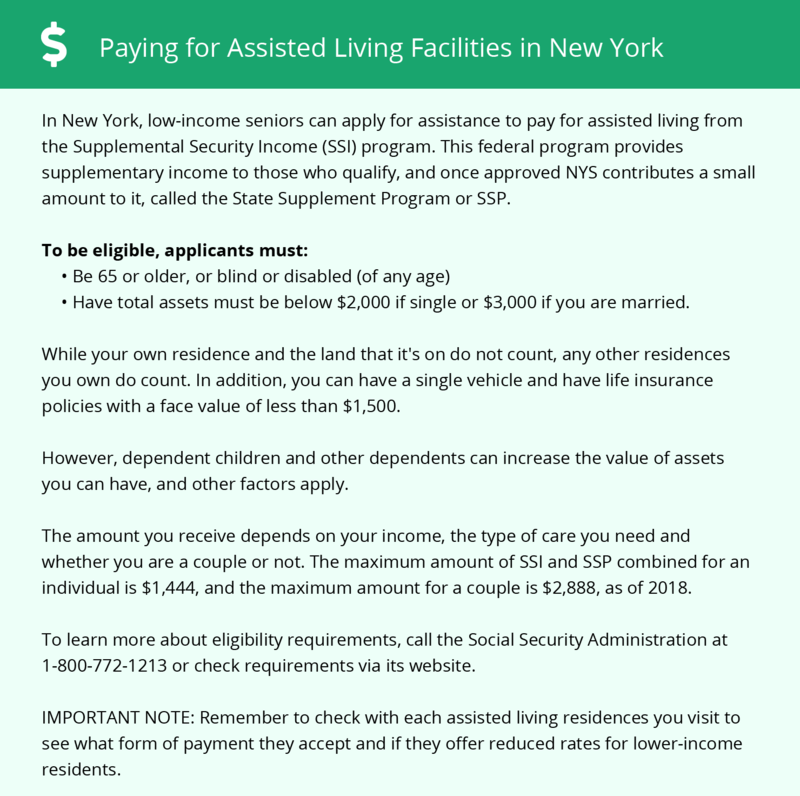 Seniors seeking financial aid for ACFs in the Bronx should look to the Medicaid program's Assisted Living Program (ALP) waiver. This opportunity is limited to 4,200 persons, though citizens can be private-paying and still qualify. Bronx and the surrounding area are home to numerous government agencies and non-profit organizations offering help for seniors searching for or currently residing in an assisted living community. These organizations can also provide assistance in a number of other eldercare services such as geriatric care management, elder law advice, estate planning, finding home care and health and wellness programs. To see a list of free assisted living resources in Bronx, please visit our Assisted Living in New York page. Bronx-area assisted living communities must adhere to the comprehensive set of state laws and regulations that all assisted living communities in New York are required to follow. Visit our Assisted Living in New York page for more information about these laws.